Citation Information: JCI Insight. 2018;3(15):e122737. https://doi.org/10.1172/jci.insight.122737. BACKGROUND. Exercise has profound pleiotropic health benefits, yet the underlying mechanisms remain incompletely understood. Endocrine FGF21, bile acids (BAs), and BA-induced FGF19 have emerged as metabolic signaling molecules. 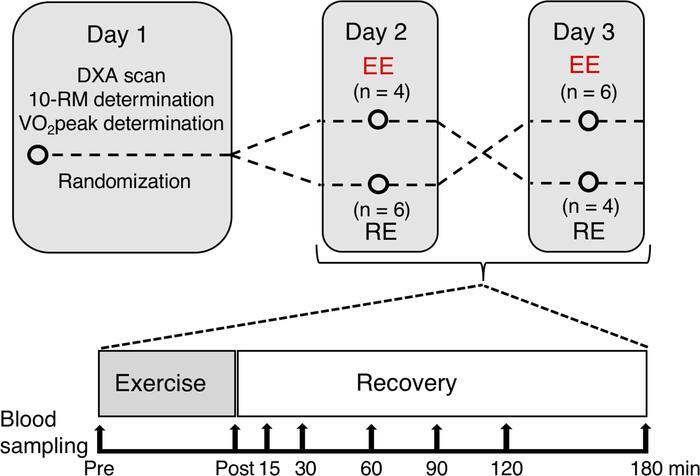 Here, we investigated if dissimilar modes of exercise, resistance exercise (RE) and endurance exercise (EE), regulate plasma BAs, FGF19, and FGF21 in humans. METHODS. Ten healthy, moderately trained males were enrolled in a randomized crossover study of 1 hour of bicycling at 70% of VO2peak (EE) and 1 hour of high-volume RE. Hormones and metabolites were measured in venous blood and sampled before and after exercise and at 15, 30, 60, 90, 120, and 180 minutes after exercise. RESULTS. We observed exercise mode–specific changes in plasma concentrations of FGF19 and FGF21. Whereas FGF19 decreased following RE (P < 0.001), FGF21 increased in response to EE (P < 0.001). Total plasma BAs decreased exclusively following RE (P < 0.05), but the composition of BAs changed in response to both types of exercise. Notably, circulating levels of the potent TGR5 receptor agonist, lithocholic acid, increased with both types of exercise (P < 0.001). CONCLUSION. This study reveals divergent effects of EE and RE on circulating concentrations of the BA species, FGF19, and FGF21. We identify temporal relationships between decreased BA and FGF19 following RE and a sharp disparity in FGF21 concentrations, with EE eliciting a clear increase parallel to that of glucagon. FUNDING. The Novo Nordisk Foundation (NNF17OC0026114) and the Lundbeck Foundation (R238-2016-2859). After randomization, all subjects performed both modes of exercise in a crossover design, separated by 8 ± 2 days. Exercise was performed for 60 minutes after an overnight fast. Blood sampling was performed before (Pre) and after (Post) exercise as well as during 3-hour recovery at the 15-, 30-, 60-, 90-, 120-, and 180-minute time intervals after exercise. RM, repetition maximum; EE, endurance exercise; RE, resistance exercise.